Click here for our Stone and Grout Care Guide! Cleaning marble showers is not always an easy task. Because showers are regularly exposed to water containing minerals, high alkaline soap and shampoos, the marble surface easily accumulates soap scum buildup. Additionally, when household cleaners are used (many of which contain harmful chemicals that are high in alkaline or acidic substances which attack the marble surface,) the result is etching (or “etch marks,”) which often require more than a marble cleaner to correctly restore the damaged marble. If you’re wondering how to clean and restore your marble shower in the most effective manner, this blog post will enlighten you on the best way to clean and restore your marble shower floors and walls. 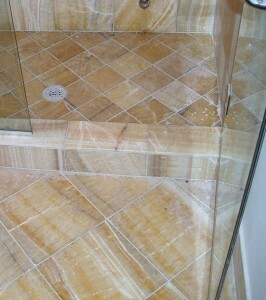 Cleaning marble shower floors is one of the most difficult areas to tackle. Residue from dirty water, soap, and shampoo, can build over time, making it hard to completely clean a marble floor. In most cases, a simple marble cleaner is just not enough. In cases of where etch marks, scratches, water spots are present, a marble restorer is the best companion for the job. Here at Marble-Cleaning-Products.com, we stand by our Marble Gloss Restorer, which is a proprietary compound that effectively removes etching, stains, water spots, and minor scratches from marble shower floors. Our Marble Gloss Restorer is a versatile product that also works great on marble vanities, counter tops, and other marble surfaces throughout the home. If you own Thassos (pure white), Breccia Nouvella (dark brown), Verde Antique (dark green), or Belgium Black (absolute black) marble shower flooring we suggest using our Marble Glass Restorer Special Formula. This is because the mineral composition of these types of marble demand a unique compound to render a high gloss finish. Similar to marble floors, cleaning marble shower walls can offer the same restorative challenges. Over time, shower walls are susceptible to etching, dull marks, and unattractive streak lines showing loss of color and gloss. In most situations, this calls for a more extensive approach to cleaning and restoring the marble. Before calling a professional marble restoration company, consider investing in one of our do-it-yourself marble refinishing kits. Our marble refinishing kits contain everything you need to buff, clean, and restore scratches, dull marks, etch marks, and water spots on your marble shower walls as well as shower floors. The kit even includes an instructional DVD, so you’ll be well-versed as to how to clean and restore your marble shower. Additionally, the marble refinishing kit can help you save hundreds of dollars compared to hiring a professional to do the work. After you’ve successfully cleaned and restored your marble shower, you may want to consider a polish to help protect and enhance the original beauty of the marble’s surface. A marble polish can make future shower cleaning much easier, for the polish helps to defend the marble from water, oil, and dirt penetrating the marble’s pores. The nice thing about our Marble Polish and Protector is that it does not contain any polymers and will not distort the natural color and clarity of marble. It’s safe to use and works great on a number of other natural stone surfaces like granite or travertine. There’s a lot more to cleaning marble showers than meets the eye. In many cases, a standard marble cleaner won’t cut it. To effectively bust through grime, restore etching and scratching, and renew your marble shower walls and floors – explore our professional-grade marble care products. 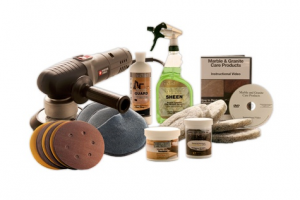 We offer everything you need to clean and restore your marble to shine like new. This entry was posted in Uncategorized and tagged clean marble, how to clean marble, how to clean marble showers, marble cleaner, marble cleaning, marble restoration, marble restorer, marble shower floors, marble shower walls, marble showers, restore marble, restore marble floor, restore marble shower by oicadmin. Bookmark the permalink. © 2013 Marble-Cleaning-Products.com. All Rights Reserved.